During our couple of days at Uluru, we could often see the incredible rock formations of Kata-Tjuta (also known as The Olgas) off in the distance. During sunsets, its red domes turned pink and purple. On our last morning in Uluru-Kata-Tjuta National Park, we got to see this area up close. First, we watched a spectacular sunrise from a viewing platform. 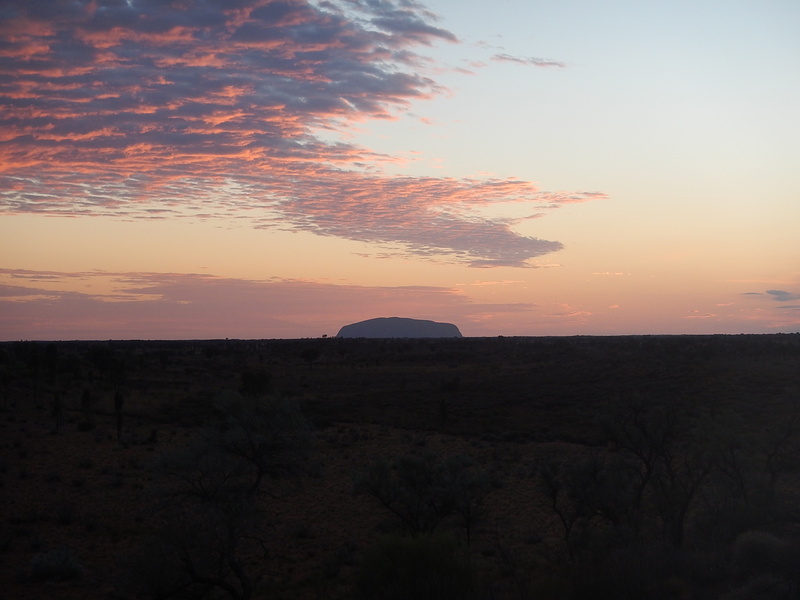 From the Kata-Tjuta sunrise viewing platform, you can also see Uluru off in the distance. The cloud formations that morning made for some great photography. 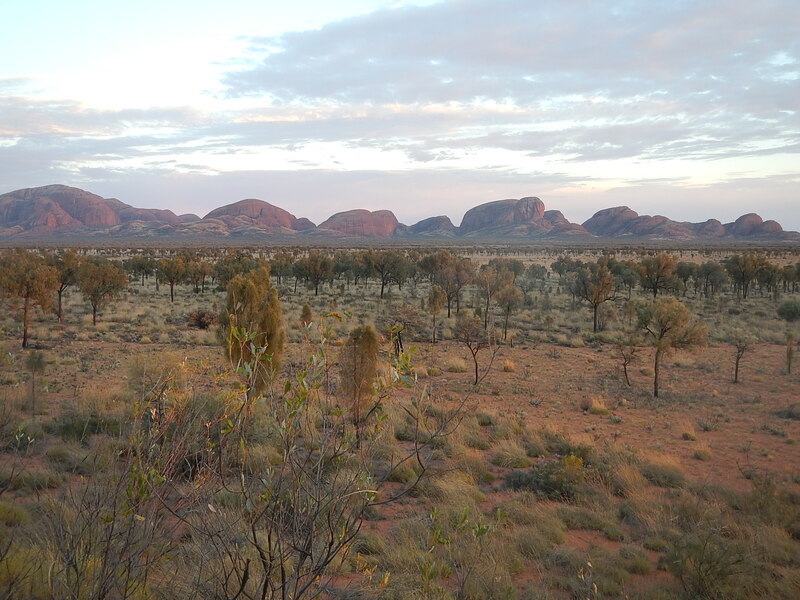 The thirty-six orange-red domes of Kata-Tjuta are made up of conglomorate, a sedimentary rock mixing various rock types. Water seeping down the rock and erosion formed the domes over several millenia. Kata-Tjuta is also known as the Olgas, named after Queen Olga of Wurttemberg by Australian explorer Ernest Giles, the first European to discover these rock formations. In 1985, the Olgas were handed back to the Pitjantjatjara people along with Uluru and in 1993 were given their traditional Aboriginal name. The Aboriginies keep Kata-Tjuta shrouded in mystery. Traditionally, it was a place where only men could go. In fact, the Aboriginies have a strict division between “men’s business” and “women’s business” and do not mix the two. To this day, they do not reveal much of the Dreamtime stories about Kata-Tjuta or permit outsiders to hike through most of it. 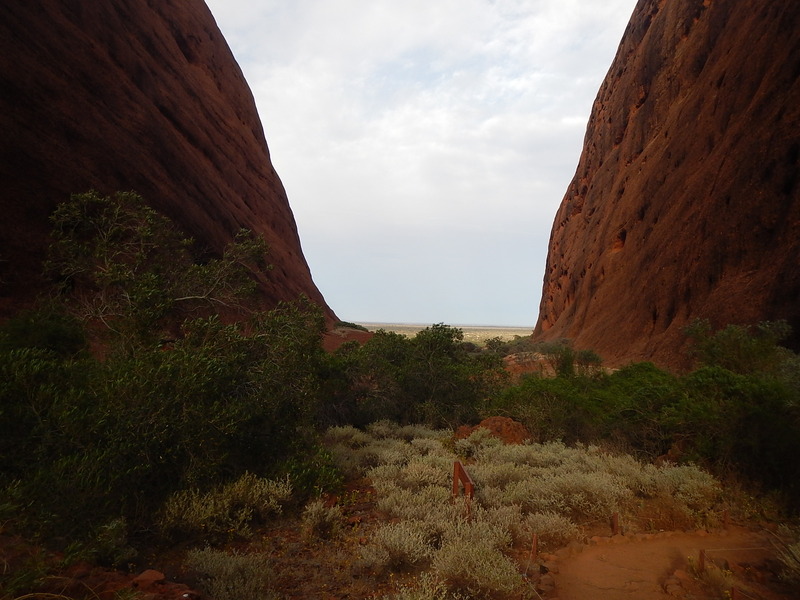 Fortunately, we were able to explore Walpa Gorge, a section of Kata-Tjuta that I found to be beautiful and refreshing. Two of the greatest annoyances while visiting Uluru, other than hordes of tourists, are flies and heat. Walpa Gorge had a strong wind blowing through it which, in addition to the early hour, made it so cool that I actually needed a jacket. The wind also mercifully kept the most of the flies at bay. While on the hike, we saw plants that are found no where else in the region and also a tree kangaroo. In one of the few Dreamtime stories about Kata-Tjuta shared with the public, the rocks are the home of the snake, Wanambi. In the rainy season, he remains inactive, coiled at the summit. However, in the dry season, he slithers down to the gorge. They believe that Wanambi’s breath is what you feel when you are walking through the windswept gorge. While Kata-Tjuta is not as famous as Uluru, you definitely should not miss it if you happen to be in the area. 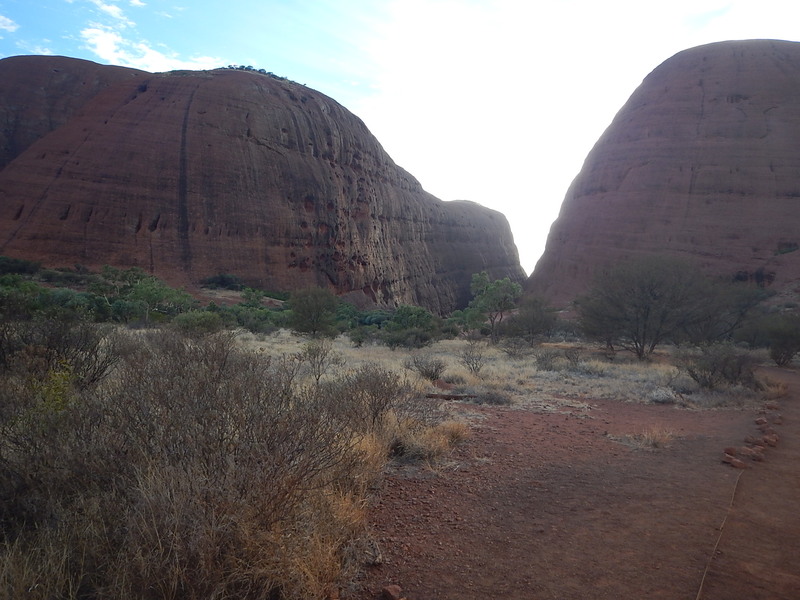 In fact, some people say that they enjoyed their visit to Kata-Tjuta even more than their visit to Uluru. I count myself among them. I am intrigued by this hauntingly beautiful place.